Conway Twitty was an artist who successfully spanned the rock ‘n’ roll, pop and country genres in a career that lasted over three decades, and was best-known for his landmark US and UK No. 1 “It’s Only Make Believe”. This great-value 62-track 2-CD set comprises the A & B sides of his singles for Mercury and MGM during this formative era in his career, during which he not only had his iconic No. 1 with the brooding and dramatic “It’s Only Make Believe”, but had thirteen other chart entries, including the US No. 6 “Lonely Blue Boy” and the UK No. 5 “Mona Lisa”, before forging a niche as a leading force in the country market. 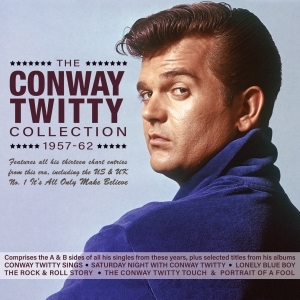 It also includes selected tracks from his albums released during these years, “Conway Twitty Sings”, “Saturday Night with Conway Twitty”, “Lonely Blue Boy”, “The Rock & Roll Story”, “The Conway Twitty Touch”, and “Portrait Of A Fool”. It is a substantial overview of his output during this period, showcasing not only his fine voice, but his versatility in performing material from out-and-out rock ‘n’ roll to ballads and country-flavoured songs with equal panache.